Wisconsin‘s 2018 season obviously did not go as planned. In the offseason, two of the receivers thought to be a key part of the Badgers were Quintez Cephus and Zander Neuville. Cephus missed the entire season due to a suspension and Neuville was injured early and played only a handful of snaps. A.J. Taylor emerged as the No. 1 receiver — at least when Alex Hornibrook was at quarterback. Taylor was third among targets when Jack Coan was under center, with Danny Davis the leader and tight end Jake Ferguson second. Davis ended up with the most targets on Wisconsin — although that was augmented by his 13 targets in the regular-season finale against Minnesota. No other Badgers player had double-digit targets in a game; Taylor had nine in the season opener vs. Western Kentucky. 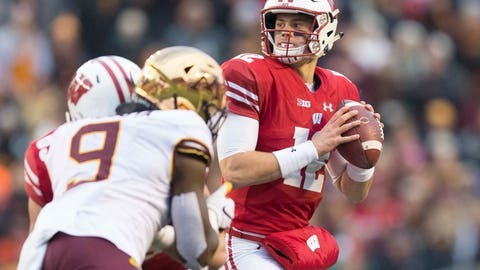 Finally, at the end of the story we list all the punts from plus-territory Wisconsin had in the regular season, with the end result for the opposing team and the Badgers’ next drive. — Drops can be subjective, but mainly for road games as Wisconsin does list dropped passes in its play-by-play sheets. — Lost/Pen means a catch was nullified due to an offensive penalty. — Inc/Pen means a pass was incomplete (or intercepted) but there was a penalty on the play (often defensive pass interference). For those curious, Danny Vanden Boom had one target to Taj Mustapha. Wisconsin had 21 holding penalties this season, which was its highest infraction. There were 14 false starts, 11 personal fouls, 10 pass interferences and nine offsides. In the chart below, note that D means declined. Also, the unit (offense, defense, special teams) on the field during the time the penalty occurred is noted. The Badgers had 19 punts within the opponent’s territory — i.e., plus-territory. This does not include punts from Wisconsin’s own 45 to the 50, which there were some as well. This is the first year I’ve tracked plus-territory punts, but 19 still feels like a lot.